Samuel Adams (27 September 1722 – 2 October 1803) was an American revolutionary and organizer of the Boston Tea Party. He was governor of Massachusetts from 1793 to 1797. Instead of sitting down satisfied with the efforts we have already made, which is the wish of our enemies, the necessity of the times, more than ever, calls for our utmost circumspection, deliberation, fortitude, and perseverance. Property is admitted to have an existence, even in the savage state of nature. The bow, the arrow, and the tomahawk; the hunting and the fishing ground, are species of property, as important to an American savage, as pearls, rubies, and diamonds are to the Mogul, or a Nabob in the East, or the lands, tenements, hereditaments, messuages, gold and silver of the Europeans. And if property is necessary for the support of savage life, it is by no means less so in civil society. The Utopian schemes of levelling, and a community of goods, are as visionary and impracticable, as those which vest all property in the Crown, are arbitrary, despotic, and in our government unconstitutional. Now, what property can the colonists be conceived to have, if their money may be granted away by others, without their consent? Neither the wisest constitution nor the wisest laws will secure the liberty and happiness of a people whose manners are universally corrupt. He therefore is the truest friend to the liberty of his country who tries most to promote its virtue, and who, so far as his power and influence extend, will not suffer a man to be chosen into any office of power and trust who is not a wise and virtuous man. We must not conclude merely upon a man's haranguing upon liberty, and using the charming sound, that he is fit to be trusted with the liberties of his country. It is not unfrequent to hear men declaim loudly upon liberty, who, if we may judge by the whole tenor of their actions, mean nothing else by it but their own liberty, — to oppress without control or the restraint of laws all who are poorer or weaker than themselves. It is not, I say, unfrequent to see such instances, though at the same time I esteem it a justice due to my country to say that it is not without shining examples of the contrary kind; — examples of men of a distinguished attachment to this same liberty I have been describing; whom no hopes could draw, no terrors could drive, from steadily pursuing, in their sphere, the true interests of their country; whose fidelity has been tried in the nicest and tenderest manner, and has been ever firm and unshaken. If you, or Colonel Dalrymple under you, have the power to remove one regiment you have the power to remove both. It is at your peril if you refuse. The meeting is composed of three thousand people. They have become impatient. A thousand men are already arrived from the neighborhood, and the whole country is in motion. Night is approaching. An immediate answer is expected. Both regiments or none! The liberties of our Country, the freedom of our civil constitution are worth defending at all hazards: And it is our duty to defend them against all attacks. We have receiv'd them as a fair Inheritance from our worthy Ancestors: They purchas'd them for us with toil and danger and expence of treasure and blood; and transmitted them to us with care and diligence. It will bring an everlasting mark of infamy on the present generation, enlightened as it is, if we should suffer them to be wrested from us by violence without a struggle; or be cheated out of them by the artifices of false and designing men. Of the latter we are in most danger at present: Let us therefore be aware of it. Let us contemplate our forefathers and posterity; and resolve to maintain the rights bequeath'd to us from the former, for the sake of the latter. — Instead of sitting down satisfied with the efforts we have already made, which is the wish of our enemies, the necessity of the times, more than ever, calls for our utmost circumspection, deliberation, fortitude, and perseverance. Let us remember that "if we suffer tamely a lawless attack upon our liberty, we encourage it, and involve others in our doom." It is a very serious consideration, which should deeply impress our minds, that millions yet unborn may be the miserable sharers of the event. What a glorious morning is this! Comment upon hearing the gunfire at the Battle of Lexington (19 April 1775), as quoted in An address, delivered at Lexington, on the 19th (20th) April, 1835 (1835) by Edward Everett; this has often been paraphrased as "What a glorious morning for America!" We cannot make Events. Our Business is wisely to improve them. There has been much to do to confirm doubting Friends & fortify the Timid. It requires time to bring honest Men to think & determine alike even in important Matters. Mankind are governed more by their feelings than by reason. The eyes of the people are upon us. [...] If we despond, public confidence is destroyed, the people will no longer yield their support to a hopeless contest, and American liberty is no more. [...] Despondency becomes not the dignity of our cause, nor the character of those who are its supporters. Let us awaken then, and evince a different spirit, - a spirit that shall inspire the people with confidence in themselves and in us, - a spirit that will encourage them to persevere in this glorious struggle, until their rights and liberties shall be established on a rock. We have proclaimed to the world our determination 'to die freemen, rather than to live slaves.' We have appealed to Heaven for the justice of our cause, and in Heaven we have placed our trust. [...] We shall never be abandoned by Heaven while we act worthy of its aid and protection. Let Divines, and Philosophers, Statesmen and Patriots unite their endeavours to renovate the Age, by impressing the Minds of Men with the importance of educating their little boys, and girls — of inculcating in the Minds of youth the fear, and Love of the Deity, and universal Phylanthropy; and in subordination to these great principles, the Love of their Country — of instructing them in the Art of self government, without which they never can act a wise part in the Government of Societys great, or small — in short of leading them in the Study, and Practice of the exalted Virtues of the Christian system. Every natural right not expressly given up, or, from the nature of a social compact, necessarily ceded, remains. All positive and civil laws should conform, as far as possible, to the law of natural reason and equity. If men, through fear, fraud, or mistake, should in terms renounce or give up any essential natural right, the eternal law of reason and the grand end of society would absolutely vacate such renunciation. The right to freedom being the gift of God Almighty, it is not in the power of man to alienate this gift and voluntarily become a slave. When men enter into society, it is by voluntary consent; and they have a right to demand and insist upon the performance of such conditions and previous limitations as form an equitable original compact. Every natural right not expressly given up, or, from the nature of a social compact, necessarily ceded, remains. All positive and civil laws should conform, as far as possible, to the law of natural reason and equity. The natural liberty of man, by entering into society, is abridged or restrained, so far only as is necessary for the great end of society, the best good of the whole. In the state of nature every man is, under God, judge and sole judge of his own rights and of the injuries done him. By entering into society he agrees to an arbiter or indifferent judge between him and his neighbors; but he no more renounces his original right than by taking a cause out of the ordinary course of law, and leaving the decision to referees or indifferent arbitrators. In the last case, he must pay the referees for time and trouble. He should also be willing to pay his just quota for the support of government, the law, and the constitution; the end of which is to furnish indifferent and impartial judges in all cases that may happen, whether civil, ecclesiastical, marine, or military. Government was instituted for the purposes of common defence, and those who hold the reins of government have an equitable, natural right to an honorable support from the same principle that "the laborer is worthy of his hire." But then the same community which they serve ought to be the assessors of their pay. Governors have no right to seek and take what they please; by this, instead of being content with the station assigned them, that of honorable servants of the society, they would soon become absolute masters, despots, and tyrants. Hence, as a private man has a right to say what wages he will give in his private affairs, so has a community to determine what they will give and grant of their substance for the administration of public affairs. And, in both cases, more are ready to offer their service at the proposed and stipulated price than are able and willing to perform their duty. Government was instituted for the purposes of common defence … In short, it is the greatest absurdity to suppose it in the power of one, or any number of men … to renounce their essential natural rights, or the means of preserving those rights; when the grand end of civil government, from the very nature of its institution, is for the support, protection, and defence of those very rights; the principal of which, as is before observed, are Life, Liberty, and Property. If men, through fear, fraud, or mistake, should in terms renounce or give up any essential natural right, the eternal law of reason and the grand end of society would absolutely vacate such renunciation. The right to freedom being the gift of God Almighty, it is not in the power of man to alienate this gift and voluntarily become a slave. The supreme power cannot justly take from any man any part of his property, without his consent in person or by his representative. … Now what liberty can there be where property is taken away without consent? He who made all men hath made the truths necessary to human happiness obvious to all. Our forefathers threw off the yoke of Popery in religion; for you is reserved the honor of leveling the popery of politics. They opened the Bible to all, and maintained the capacity of every man to judge for himself in religion. Men who content themselves with the semblance of truth, and a display of words, talk much of our obligations to Great Britain for protection. Had she a single eye to our advantage? A nation of shopkeepers are very seldom so disinterested. Did the protection we received annul our rights as men, and lay us under an obligation of being miserable? Who among you, my countrymen, that is a father, would claim authority to make your child a slave because you had nourished him in infancy? ’Tis a strange species of generosity which requires a return infinitely more valuable than anything it could have bestowed; that demands as a reward for a defense of our property a surrender of those inestimable privileges, to the arbitrary will of vindictive tyrants, which alone give value to that very property. Variant: If ye love wealth better than liberty, the tranquility of servitude better than the animateding contest of freedom — go home from us in peace. We ask not your counsels or your arms. Crouch down and lick the hands which feed you. May your chains sitset lightly upon you, and may posterity forget that you were our countrymen!. Variant: Driven from every other corner of the earth, freedom of thought and the right of private judgment in matters of conscience, direct their course to this happy country as their last asylum. We have this day restored the Sovereign to whom alone all men ought to be obedient. He reigns in Heaven, and with a propitious eye beholds his subjects assuming that freedom of thought, and dignity of self-direction which He bestowed on them. From the rising to the setting sun, may His kingdom come. We have large armies, well disciplined and appointed, with commanders inferior to none in military skill, and superior in activity and zeal. We are furnished with arsenals and stores beyond our most sanguine expectations. We cannot suppose that our opposition has made a corrupt and dissipated nation more friendly to America, or created in them a greater respect for the rights of mankind. We can therefore expect a restoration and establishment of our privileges, and a compensation for the injuries we have received, from their want of power, from their fears, and not from their virtues. The unanimity and valor, which will effect an honorable peace, can render a future contest for our liberties unnecessary. He who has strength to chain down the wolf is a madman if he let him loose without drawing his teeth and paring his nails. And that the said Constitution be never construed to authorize Congress to infringe the just liberty of time press, or the rights of conscience; or to prevent the people of the United States, who are peaceable citizens, from keeping their own arms; or to raise standing armies, unless when necessary for the defence of the United States, or of some one or more of them; or to prevent the people from petitioning, in a peaceable and orderly manner, the federal legislature, for a redress of grievances; or to subject the people to unreasonable searches and seizures of their persons, papers or possessions. Rejected resolution for a clause to add to the first article of the U.S. Constitution, in the debates of the Massachusetts Convention of 1788 (6 February 1788); this has often been attributed to Adams, but he is nowhere identified as the person making the resolution in Debates and Proceedings in the Convention of the Commonwealth of Massachusetts, Held in the year 1788 And which finally ratified the Constitution of the United States. (1856) p. 86. It does not require a majority to prevail, but rather an irate, tireless minority keen to set brush fires in the minds of men. 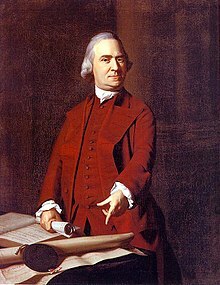 No one, in the year 1770, was better fitted than Samuel Adams, either by talent and temperament or the circumstances of his position, to push the continent into a rebellion. Unlike most of his patriot friends, he had neither private business nor private profession to fall back upon when public affairs grew tame, his only business being, as one might say, the public business, his only profession the definition and defense of popular rights. ...the serious business of a man who during ten years had abandoned all private pursuits and had embraced poverty to become a tribune of the people. Samuel Adams had not inherited poverty nor had he, after all, exactly embraced it, but had as it were naturally drifted into it through indifference to worldly gain, the indifference which men of single and fixed purpose have for all irrelevant matters. To John Adams he [Samuel] said on one occasion, "he never looked forward in life; never planned, laid a scheme, or formed a design for laying up anything for himself or others after him". This was the truth, inexplicable as it must have seemed to his more provident cousin. This page was last edited on 20 October 2018, at 01:05.